Election in Tamil Nadu's Vellore has been cancelled over the excessive use of money power, and postponed to April 23 in Tripura. The second of the Lok Sabha election 2019 will be held on April 18. Total 13 states will go to polls in the second phase, with Tamil Nadu holding polls on all Lok Sabha seats, except Vellore. A total of 1,644 candidates were in the fray for 97 Lok Sabha constituencies but the Election Commission cancelled polls in Tamil Nadu's Vellore over the excessive use of money power and postponed polls in Tripura to April 23. Among all candidates contesting polls in phase two, as many as 251 have criminal cases registered against them, including 167 with serious criminal records. A total of 423 crorepatis are contesting polls in phase two, and the average assets of all candidates are around Rs 3.9 crore. The Lok Sabha Elections 2019 will be conducted across the country in seven phases. The first phase of polls were held on April 11 when 20 states and two UT went for polls. The third, fourth, fifth, sixth and seventh phases will witness citizens voting for 115, 71, 51, 59, 59 seats, respectively. 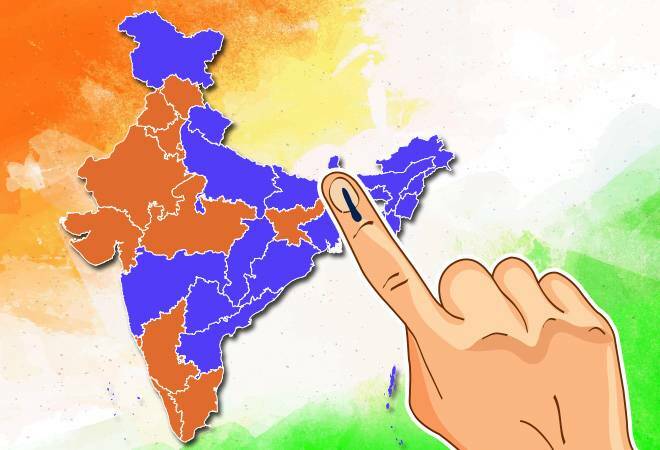 Which constituencies will vote on Phase 2 of Lok Sabha Elections 2019? What are the major parties in the states voting in Phase 2? While national parties Bharatiya Janata Party (BJP) and Congress have their presence in most states in the country, regional parties are also a force to reckon with. To begin with, Akhilesh Yadav's Samajwadi Party and Mayawati's Bahujan Samaj Party in Uttar Pradesh that has formed an alliance will prove to be a forceful third front in the state. Naveen Patnaik's Biju Janata Dal (BJD) in Odisha is facing stiff competition from the BJP this time. In West Bengal, the BJP is trying to take on Mamata Banerjee's formidable All India Trinamool Congress (AITC), while Atul Bora's Asom Gana Parishad in Assam has joined forces with the BJP against the Congress in Assam. In Maharashtra, Uddhav Thackeray's Shiv Sena is in coalition with the BJP, while Sharad Pawar's Nationalist Congress Party (NCP) and the Congress will fight the ruling party. In Tamil Nadu, DMK and AIDMK are the two most prominent political parties. How to check the name on voters' list for Phase 1 of Lok Sabha Elections 2019? Log on to the National Voter Services Portal's Electoral Search page (NVSP) and check your name on the voter's list by entering your details. You can alternatively put in your Electoral Photo ID Card (EPIC) number. What to do if you don't have a Voter ID card? Log on to the NSVP Electoral Search page and click on search by details. Put in your details, such as name, gender, age, assembly constituency etc. Based on your details, a result will pop up, which means that your name is in the voter's list. In case, there is no pop-up, it means your name is probably missing from the voter's list. The Election Commission claims to have taken various measures to ensure free and fair elections. Central Armed Police Forces (CAPFs) and State Armed Police (SAP) have been deployed across the states going to polls in the vulnerable pockets. The forces will also be deployed in the expenditure sensitive constituencies and critical polling stations. On the poll-eve, the CAPFs/SAP will control the respective polling stations and provide security to the electors and polling personnel. Further, the entire force deployment in the assembly segments will be under the oversight of the central observers deputed by the commission. How is EC monitoring election expenses? The EC has issued comprehensive instructions for the effective monitoring of the election expenditure of the candidates. State Excise Department, Commercial Tax Department, Narcotics Control Bureau and police authorities have been asked to monitor production, distribution, sale and storage of liquor and other intoxicants (including narcotics) and inducements in the form of free goods during the election process. The functioning and operations of the flying squads/mobile teams will be closely monitored using GPS Tracking and the use of cVigil App. For greater transparency and for the ease of monitoring of election expenses, candidates are required to open a separate bank account and incur their election expenses from that very account. The Investigation Directorate of the Income Tax Department has been asked to activate air intelligence units in the airports of the state and also to gather intelligence and take necessary action against movement of a large sum of money. What can you do if you report any violation of Model Code of Conduct? Through the ECI's mobile app, cVIGIL, people report about any violation of Model Code of Conduct, any incident of intimidation or inducement within minutes of having witnessed. cVIGIL is an Android-based mobile app, which is user-friendly. "All that one has to do is to simply click a picture or to take a video and briefly describe the activity before uploading it on the cVIGIL mobile application. If the complainant desires to remain anonymous he has the option to do so," says the EC. The district control room allocates cVIGIL cases to the flying squads, which further investigate the matter. The status of the complaint is also with the cVIGIL complainant in 100 minutes.